I do not get a lot of time to paint anything these days. So I rushed these a bit, finishing the lot in a matter of a hour or two. Really simple paint job, it took longer to clean the parts for mold lines than to paint, as they were really thick with lines and molding imperfections to the point many could not be properly removed as this would ruin the figures not to mention the detail. This lot have probably the worst set of mould lines in restic I have encounterd yet, together with the Zzor team that I recieved at the same time..I probably should have compained to the point of demaning new figures. But they still work for gaming purposes, but I cannot be bothered to try to do a better paint job on them. So anyway. I sprayed them with Army Painter Gunmetal. used ink for details, a blackm curved stripe under what is supposed to be their face, and a bright red spot at varying points along this line on the different figures, simulating the moving red eye of the cylons. I have not bothered with team numbers, and the figures need to interchange as they transform into different positions during play, and I do not have enough of the striker and guard figures to make one for each jack. 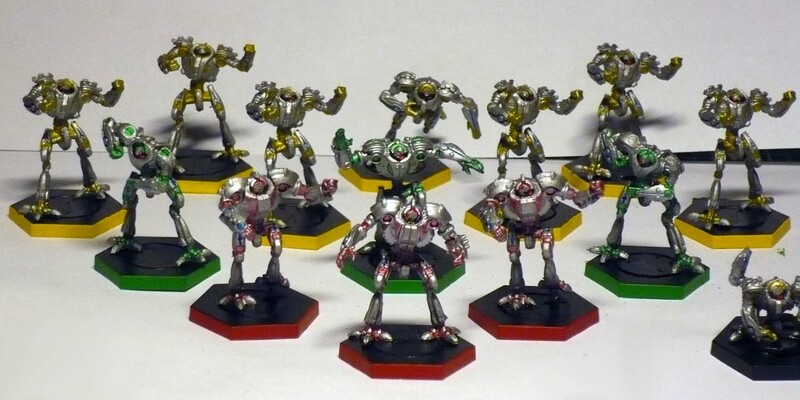 I see alot of players use the blue, grey, red, whatnot from the really old edition of Blood Bowl for their Dreadball team. But this is not Blood Bowl, so why should an old convention for a game from another publisher even apply here? Still in progress: the three robot MVPs, And I have a really fitting not to say really fit coach figure primed and ready to paint for this team.